Aberdeen manager Derek McInnes is relishing Sunday's meeting with Celtic, after seeing his side secure a 1-0 win over Ross County. The Dons won thanks to Paul Quinn's own goal, and are now just three points off Premiership leaders Dundee United. Champions Celtic visit Pittodrie on Sunday and McInnes cannot wait. "I firmly believe we're good enough to compete with any team in the league and are capable of winning against any of them," McInnes told BBC Scotland. "We have Celtic at home on Sunday, which threatens to be a brilliant affair if we can get a result," he added. Aberdeen fully deserved their victory in Dingwall - their first there in competitive action - but should have made the scoreline more convincing. , and Peter Pawlett smashed a second-half effort off the bar. "I'm delighted with our third clean sheet in a row," McInnes said. "We've had a change of system of late and there's been a debate about whether we create as many opportunities in the system we play. Certainly we don't look like losing many goals, but tonight we created lots and if we go and score three or four it's maybe a fairer reflection on the game in terms of the dominance we had. "To come up here on a Monday night, when it's cold and wet, it's never easy. The players deserve so much credit and I'm really pleased." "We had good build-up play in the first half without threatening too much but in the second half we got into good areas, we hit the bar, passed up opportunities, slashed things over the bar and maybe picked the wrong choice at times. "Nobody could deny it was a strong performance from us, especially in the second half. 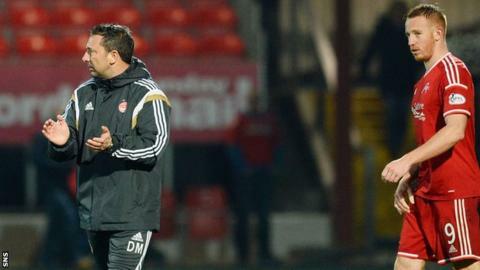 The winner came after the break when Shay Logan's delivery was diverted into his own net by Quinn, and McInnes was delighted that his players had learned their lesson from the first half. "It's harsh on them with the own goal but we were asking players to fizz things in around defenders' feet," he said. "In the first half we were floating too many things into the box, I thought we had to use the conditions more."